We are excited to have launched Grestec’s first tile studio, fully equipped with a relaxed, creative atmosphere that offers an unsurpassed space for architects and designers to develop and design any project. The space incorporates 100×100 samples to take away, A5 sample cards, full-sized large format tiles and a multitude of pick-up, trendy tiles placed across the counter-tops to inspire for the next project. The studio will initially run on an appointment only basis, but will be formally accessible throughout the duration of the design shows at the BDC including, the Surface Design Show, Sleep Event, Digital Construction Week, and the New Designers show. 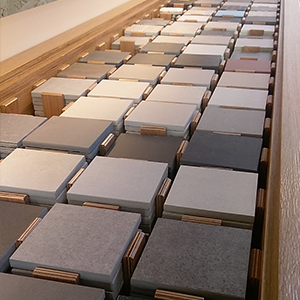 The new studio will not only provide an unparalleled space for our clients to view our expansive range of tile collections, but will be a base to explore new concepts and gain technical tile knowledge from our informed representatives. Call us on 0345 130 2241 or email mail@grestec.co.uk to arrange a meeting.